Every company wants to see its business grow. Because much of its success relies upon the productivity of its workforce, employees’ performance is of the utmost importance for businesses. However, poor safety and health conditions in the workplaces frequently expose employees to several occupational risks, which not only pose problems for their health and safety, but also diminishes their performance. Noise is one of the most common occupational hazards, which has been a matter of concern because of its implications on workers’ health, mostly in industrial settings., However, it is important to keep in mind that occupational noise is also relevant in several other working settings, such as call centers, schools,,, offices, or even food establishments. In addition, it is important to realize that noise exposure is not only relevant to the workers’ health. It can also have a negative effect on workers’ well-being and performance. The influence of noise on workers’ performance has been subject of recent studies (refer to Khajenasiri et al. or Nassiri et al.). The most emphasized mechanisms in the literature are the noise interference in working memory and attention. Working memory processes refer to a limited capacity system that provides temporarily store and handle the needed information for complex cognitive tasks as language comprehension, learning, and reasoning., Noise appears to affect working memory and the different tasks where it is relevant. It has a negative effect on serial recall, revision, mental arithmetic, reading comprehension, and operation span tasks, as well as on tasks activating prior knowledge from long-term memory.,, Working memory processes are extremely important when complex tasks are being performed, because the participants need to process, store, and manage the required information. In what regards to attention, it is a process that allows to take information in and should enable sustained performance on tasks over extended periods of time. It enables the maintenance of vigilance, selective and focused attention, response persistence, and continuous effort despite changing conditions. As pointed in literature reviews, noise has a negative effect on tasks requiring attention. Despite the foregoing, it is important to note that implications of noise on attention and short-term memory is dependent of its characteristics, such as the sound pressure level, the frequency response, and the type of sound, as well as of the type of task being developed. Sound pressure levels are one of the most emphasized factors in literature. Previous studies identified a direct relationship between precision and this sound characteristic, where increased sound pressure levels diminish performance and increase errors in different cognitive and manual tasks.,,,, Noise intermittency was also noticed to have an important influence on individuals’ performance. Intermittent sound is considered more harmful than continuous sound and is responsible for distraction, as well as for the decrease in work performance, particularly when completing complex cognitive tasks.,,, The frequency response is another factor highlighted in the literature. High-frequency noise is more irritating and disturbing compared to the low-frequency noise,, being related to a decrease in precision during task completion. Hypothesis 1: Reaction time during the development of attentional and storage tasks increases under more adverse noise conditions. Hypothesis 2: Number of errors during the development of attentional and storage tasks increase under more adverse noise conditions. Hypothesis 3: The higher the levels of discomfort, stress, and annoyance perceived by the participants during the trials, the higher the reaction time and number of errors. Before beginning the experimental procedure, all participants signed a consent form. In addition, the study’s objectives were clarified and participants received a small theory and practice training about the tests and equipment to become familiar with them. The study was conducted in accordance with the Helsinki Declaration and approved by the Ethical Committee of the institution where the research was performed. In a first stage, the noise levels during an entire typical workweek of a selected fast food restaurant were characterized and recorded (Tascam DR-05 recorder). This information was critical to the experiment design, which had the intention to simulate the real working conditions. Three noise dosimeters (CESVA, CESVA instruments S.L.U., Barcelona, Spain, model DC112) were used for the evaluation of sound pressure levels. This equipment was chosen due to its flexibility, allowing its location in strategic places of the kitchen and counter, without interfering with the normal operation of the establishment. The measurements were conducted throughout the entire working period (7 days of a workweek). In addition, a sound level meter (CESVA, model SC310) was used to describe the alarm sounds emitted by the kitchen machinery. These sounds were collected when the restaurant was still closed, to limit additional sounds related to other tasks developed by workers. All the equipment was verified before and after each series of measurements at 94 dB(A) with a sound calibrator. Data referring to A-weighted equivalent continuous sound level (Lp,A,eqT) of the environmental noise, as well as Lp,A,eqT and third octave frequency data of the alarm sounds emitted by the machines in the company were taken. Data showed that sound pressure levels during the quietest period were about 60 dB(A) and during the period where the machines were emitting end of cycle alarm sounds the noise levels ranged between 66.9 and 70.7 dB(A), but the average was about 68 dB(A). Alarm sounds were preeminent in the frequency of 1000 Hz and the pressure level was about 80 dB(A). With base on these results, the experiment was designed. An experimental procedure that involved three acoustic conditions was designed: (1) standard condition, 45 ± 0.3 dB(A); (2) environmental noise without alarm sounds, 60 ± 0.4 dB(A); and (3) environmental noise with alarm sounds, 68 ± 0.4 dB(A). Conditions (2) and (3) were defined with basis on sound pressure levels measurements in loco, as described in the previous subsection. In Condition (3), alert sounds with a frequency of 1000 Hz were produced. Their intensity was adjusted until achieve a sound level of 80 dB(A) and then, records of environmental noise taken from a fast food restaurant were reproduced until obtain an Lp,A,eqT of 68 dB(A). Different end of cycle alarm patterns were defined [1000 Hz, 80 dB(A)] and pulsed with a duration from 500 to 1500 ms, simulating when one or more machines were emitting sound signals. These stimuli patterns were emitted randomly during a same test, to avoid creating habituation and expectation in the participants, that is, three to five stimuli were given with a time interval of 1 s followed by rest period of 3 to 5 s. Condition (1) was used as a control variable, where no source of noise was created, that is, it referred only to background sounds. All the experimental procedures were conducted in a research laboratory of the institution. The laboratory was adapted to create a simulated environment. A desk, which allowed each participant to be seated during the tests, was placed in the room. 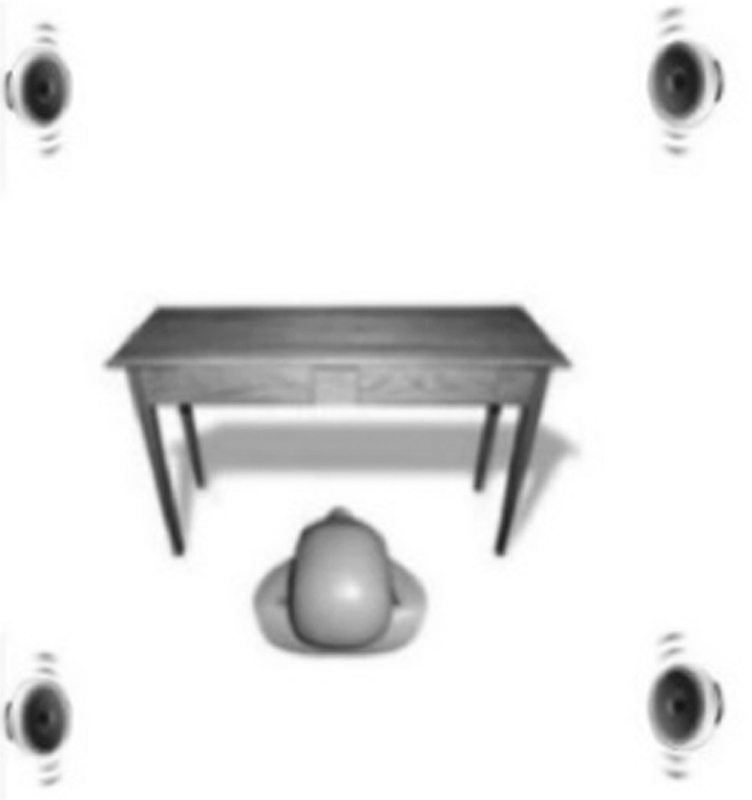 As represented in [Figure 1], four speakers, two on each side, were placed around the desk, projecting the recorded environmental noise and producing the other alarm sounds. A test battery was constructed and applied in each acoustic condition: serial recall, response inhibition, and Stroop interference [Appendix A]. The instruments used to conduct these tests were put on the desk in an independent and sequential way. All the tests were explained and tested by the participants before the experiment. Under a same noise condition, participants were asked to complete all the test battery. Therefore, each participant completed each test three times, that is, under each noise condition (C1–C3). A period of rest between the tests of 5 min and between the trials of 10 min was provided to the participants. After each trial, a visual analog scale (VAS) was used to measure the participants’ discomfort, stress, and annoyance perceptions [Appendix B]. All the tests were completed by the participants under the same noise conditions. Sound pressure levels were monitored throughout each section with a sound level meter (CESVA, model SC310). A variation of 0.5 dB(A) in relation to the predefined sound pressure levels was considered acceptable for this study. All the experiments were performed during the morning, ensuring that the participants had slept at least 7 h the night before. Each experimental procedure had, on average, a duration of 30 min per participant. The independent variables defined in the study were the three conditions of simulated noise, which differ in relation to the sound pressure levels and the type of noise. The dependent variables were the time taken to complete the task in seconds, as well as the number of mistakes made by participants, or rather, the amount of times that an error occurred while completing a task. In this study, the amount of coffee consumed prior to the experiment, the number of hours slept the night before, the level of stress, or even any anxiety or depression reported were considered important control variables. Sound recorder: Occupational noise and the alarm sounds emitted by the machines presented in the selected fast food restaurant were recorded independently (Tascam DR-05, TEAC Europe GmbH, Wiesbaden, Germany) and edited in the Audacity® Software version 2.1.3 (The Audacity Team, Pittsburgh, Pennsylvania, United States of America). The environmental sound recorded was reproduced in the laboratory after editing. Sound level meter: For the characterization of the sound pressure levels and the frequency response, a CESVA SC130 sound lever meter Type 1 was used. During each session, Lp,A,eqT values were monitored. Stopwatch: A stopwatch ACCUSPLIT AX602 PRO (Accusplit, Pleasanton, California, United States of America) was used to record the time taken by the participants to perform the tests. Noise production software: The noise and alert sounds stimuli were controlled by Otometrics software and the Madsen Astera (GN Otometrics, Taastrup, Denmark) audiometer equipment. Questionnaire for general control information: Before beginning the experimental procedure, each participant completed a questionnaire with the objective of collecting general control information, like the number of hours slept the night before, the amount of coffee consumed, the number of cigarettes smoked, and medication taken. Depression, Anxiety and Stress Scales (DASS-21): The level of depression, anxiety, and stress of each participant was measured by the Portuguese version of the DASS-21. The DASS-21 comprises three seven-item self-report scales that measure depression, anxiety, and stress., These items consisted of a sentence that refers to negative emotional symptoms. The test participants were asked to evaluate the severity or frequency with which they experienced each of the 21 negative emotional symptoms during the previous month using a four-point Likert-type scale: 0—“nothing applied to me,” 1—“applied to me sometimes,” 2—“applied to me many times,” 3—“applied to me most of the time.” Scores for DASS-21 were determined by summing the scores for the relevant items. If the sums of points for depression were between 0 and 9, for anxiety between 0 and 7, and for stress between 0 and 14, the participants were considered as having a normal health condition. VASs: VASs were used to estimate the level of stress, discomfort, and annoyance perceived by the participants in the three acoustic conditions [Appendix B], in line with previous studies.,, The VAS consisted of a line with 100 mm in length, labeled at each end as “Not at all…” at the left end, and “Extremely…” at the right. Participants were asked to mark across the line the point that indicated the level of stress, discomfort, and annoyance that they were feeling. The distance of the mark from the left line was taken as the score. Serial recall test: The participants were told to memorize a key of seven one-digit numbers and then recall them in the correct order. Each number was presented for 1 s and the trial consisted of five keys. Only numbers written in their correct positions were scored as correct. The keys of seven one-digit numbers used in this experiment are described in Appendix A. Response inhibition: The response inhibition was measured with the sustained attention to response test, which assess the ability to inhibit a physical response and/or sustained attention, in the same way as Jahncke et al. Digits from 1 to 9 were presented repetitively and the participants were told to respond with a key press to all numbers except number 3. The digits were presented on the computer screen for 1000 . Each trial consisted of 100 digits, where 22% were targets (number 3) to which the response was to be inhibited. The following scores were considered: (1) the sum of errors of commission; (2) the sum of errors of omission; (3) reaction time. The sequences of the numbers used in this experiment are described in Appendix A.
Stroop interference test: Stroop interference test was composed of two tasks, one reading words and the other naming colors. In both, the stimuli were colors’ names printed in incongruous colors. This test is frequently used to study impaired concentration and difficulty in warding off distractions under noise conditions., The procedure presented in Alimohammadi et al. was applied in this study. In the first stage, participants read the words without considering the color of the word. In the second stage, they named the color that was present in the word. The following scores were determined: (1) number of incorrect reactions in reading; (2) number of incorrect reactions in naming the color; (3) reaction time (seconds). However, for this pilot study, only results about the number of incorrect reactions and delayed reaction times under conditions of color/word interference were considered as performance parameters. Additional information about this test is presented in Appendix A.
Normality was tested through the application of the nonparametric Shapiro–Wilk test and the analysis of standardized residual distributions, skewness, and kurtosis. Subsequently, comparisons of the means were made through the analysis of variance (ANOVA) test, after verification of the assumptions (normality and sphericity). The Bonferroni method was used for post hoc tests. Eta-squared (η2) was calculated to evaluate the effect size of independent variables. When the variables did not exhibit normal distribution, the nonparametric Friedman’s test was applied and Kendall’s W was calculated to evaluate the effect size. Correlation analyses were made using Pearson’s and Spearman’s correlation coefficients. The Spearman’s correlation was used in the cases were normality was violated. All statistical analyses were conducted using statistical software package IBM Statistical Package for the Social Sciences (SPSS Statistics) version 23 (International Business Machines Corp. (IBM), North Castle, New York, United States of America). The significance level used was P < 0.05. In what regards to the experimental results, [Table 1] presents the descriptive statistics and compares the results achieved for the three tasks in the three noise conditions. Results revealed that, in general, a poorest task performance was found for the condition C3. In fact, the results showed an increase in the number of errors and a longer reaction time under the more adverse noise condition. In what regards to reaction time, similar results were found in both tests where this parameter was analyzed. In Stroop interference test, reaction time was higher in the condition C3 (32.80 ± 1.31) and was lower in the condition C1 (28.20 ± 1.13) [F(2, 42) = 3.41, P < 0.01, η2 = 0.37: moderate effect size]. The results for the response inhibition test showed the same, that is, in the condition C3, the reaction time was higher (1.24 ± 0.03) when compared to the condition C1 (1.00 ± 0.02) [F(2, 42) = 14.43, P < 0.01, η2 = 0.63: large effect size]. The number of errors was also higher in C3 for all memory and attention tests. For the serial recall test, the results showed that as the noise intensity increased, the number of errors also increased, that is, the number of errors in condition C3 was higher than C2 and C1, and condition C2 was higher than C1 [F(2, 42) = 8.26, P<0.01, η2 = 0.53: large effect size]. Significant differences were observed in pairwise analysis for all situations (P < 0.05). In the Stroop interference test and in the response inhibition test, similar results were observed. Higher number of errors were identified in condition C3 in Stroop interference test [χ2(2) = 0.67, P<0.01, W = 0.67: large effect size] and in response inhibition test [F(2, 42) = 28.41, P<0.01, η2 = 0.62: large effect size]. Significant differences were found in the pairwise comparisons (P < 0.05). At the end of each test battery in the three noise conditions, participants’ perceptions about discomfort, stress, and annoyance were assessed. [Table 2] presents the descriptive statistics of these variables. As the sound pressure levels increased, the participants’ discomfort, stress, and annoyance perceptions also increased (P < 0.05). In the condition C3 were observed higher levels of discomfort (4.6 ± 1.9), stress (4.7 ± 1.9), and annoyance (5.5 ± 2.0). Positive correlations were observed between annoyance and discomfort perceptions (r = 0.801; P < 0.01), as well as between annoyance and stress perceptions (r = 0.560; P < 0.01) only for C3, that is, in this noise condition, as the participants’ discomfort and stress levels increased, the annoyance levels also increased. The relationship among discomfort, stress, and annoyance perceptions with the tests results were also analyzed. However, no significant results were found for the relation of these variables and the number of errors or reaction time in none of the analyzed conditions (P > 0.05). In a first stage, noise levels were measured in a fast food restaurant. The sound pressure levels found were, in general, considered low, not presenting risk of noise induced hearing loss (NIHL).,,, However, due to the sound proprieties observed, implications on workers’ performance can emerge. In view of this, for a deeper analysis of this influence, an experiment in a controlled environment was performed. Students were used to this end, due to the difficulty in finding a significant sample of workers that comply with the inclusion criteria to participate. It is important to realize that in real working conditions, there are other important distractors, such as visual and emotional stimulus.,,,, Visual distractors have been demonstrated to impair most cognitive functioning, including memory, deteriorating perception, and, as a consequence, reaction time.,, However, the analysis of this influence falls outside the scope of this research. The overall objective of the study was successfully achieved, giving important insights about the different noise conditions that workers are exposed in a fast food restaurant, and how they influence participants’ performance. Despite the obtained noise levels are considered without risk for NIHL, results showed that they have influence on participants’ performance. Short-term memory and attention performance was found to decline more in higher noise level working environments with intermittent sound compared to the other noise conditions, that is, number of errors and time response during all tasks were higher in this condition. It was also observed that they experienced higher levels of discomfort, stress, and annoyance in the more adverse noise condition. However, no influence of these variables on participants’ performance was identified. These results suggest the importance to create alternative solutions to food establishments, where alarm signs are regular and several mistakes with the clients’ requests observed. The results were limited to the conditions of this experiment. One of the most important limitations was the relatively small sample, where the participants were all female and undergraduate students. It is also important to note that the sound pressure level in condition C1 was 45 dB(A). Although the room was quieter than the others, it was not possible to turn off ventilation, as it would leave the participants uncomfortable. In addition, it was not possible to test another condition with 68 dB(A) without alarm sounds, because this made the test very long and tiring for the participants. The rest period provided to the participants was important to reduce the effect of tiredness in the results. However, this period may not have been enough. In next experiments, different days for the trials could be considered. The experiment was also limited to the analysis of the influence of noise on attention and short-term memory. However, in workplaces, other distractors are present and a cumulative effect can be observed. This study was a first approach to the problem of occupational noise exposure in fast food restaurants and its influence on workers’ performance. Future research should look at validation of the set up and an experimental design to be applied in field studies with workers, exploring in loco the effect of noise environmental conditions in performance. Kahya E. The effects of job characteristics and working conditions on job performance. Int J Ind Ergon 2007;37:515-23. Arezes PM, Miguel AS. Risk perception and safety behaviour: A study in an occupational environment. Saf Sci 2005;42:172-7. Dube KJ, Ingale LT, Ingale ST. Hearing impairment among workers exposed to excessive levels of noise in ginning industries. Noise Health 2011;13:348-55. Shield BM, Dockrell JE. The effects of environmental and classroom noise on the academic attainments of primary school children. J Acoust Soc Am 2008;123:133-44. Klatte M, Bergstrom K, Lachmann T. Does noise affect learning? A short review on noise effects on cognitive performance in children. Front Psychol 2013;4:578. Rodrigues MA, Amorim M, Silva MV, Neves P, Sousa A, Inácio O. Sound levels and risk perceptions of music students during classes. J Toxicol Environ Health 2015;78:825-39. Jahncke H, Hygge S, Halin N, Green AM, Dimberg K. Open-plan office noise: Cognitive performance and restoration. J Environ Psychol 2011;31:373-82. Achutan C. Assessment of noise exposure in a hospital kitchen. Noise Health 2009;11:145-50. Khajenasiri F, Zamanian A, Zamanian Z. The effect of exposure to high noise levels on the performance and rate of error in manual activities. Electron Physician 2016;8:2088-93. Nassiri P, Monazam M, Dehaghi BF, Abadi LIG, Zakerian SA, Azam K. The effect of noise on human performance: A clinical trial. Int J Occup Environ Med 2013;4:87-95. Baddeley A. Working memory. Science 1992;255:556-9. Kujala T, Brattico E. Detrimental noise effects on brain’s speech functions. Biol Psychol 2009;81:135-43. Cohen RA. Sustained attention. In: Kreutzer JS, DeLuca J, Caplan B, editors. Encyclopedia of clinical neuropsychology. New York: Springer 2011. Saeki T, Fujii T, Yamaguchi S, Harima S. Effects of acoustical noise on annoyance, performance and fatigue during mental memory task. Appl Acoust 2004;65:913-21. Habibi E, Dehgan H, Dehkordy SE, Maracy MR. Evaluation of the effect of noise on the rate of errors and speed of work by the ergonomic test of two-hand coordination. Int J Prev Med 2013;4:538-45. Muzammil M, Hasan F. Human performance under the impact of continuous and intermittent noise in a manual machining task. Noise Vib Worldw 2004;35:10-5. Nassiri P, Monazzam MR, Asghari M, Zakerian SA, Dehghan SF, Behzad F et al. The interactive effect of industrial noise type, level and frequency characteristics on occupational skills. Perform Enhanc Health 2015;3:61-5. Taylor W, Melloy B, Dharwada P, Gramopadhye A, Toler J. The effects of static multiple sources of noise on the visual search component of human inspection. Int J Ind Ergon 2004;34:195-207. Hansen KI, Gundersen H, Sunde E, Baste V, Harris A, Bråtveit M et al. Noise exposure and cognitive performance: A study on personnel on board Royal Norwegian Navy vessels. Noise Health 2015;17:320-7. Pais-Ribeiro JL, Honrado A, Leal I. 2015 Contribuição para o estudo da adaptação portuguesa das escalas de ansiedade, depressão e stress (EADS) de 21 itens de Lovibond e Lovibond. Psicol Saúde Doenças 2004;5:229-39. Lovibond SH, Lovibond PF. Manual for the depression anxiety & stress scales. 2nd ed. Sidney: Psychology Foundation; 1995. Lundquist P, Holmberg K, Landstrom U. Annoyance and effects on work from environmental noise at school. Noise Health 2000;2:39-46. Lesage FX, Berjot S, Deschamps F. Clinical stress assessment using a visual analogue scale. Occup Med (Lond) 2012;62:600-5. Sjödin F. Individual factors and its association with experience noise annoyance in Swedish preschools. Proc Meet Acoust 2017;30:015015. Alimohammadi I, Sandrock S, Gohari MR. The effects of low frequency noise on mental performance and annoyance. Environ Monit Assess 2013;185:7043-51. Alimohammadi I, Ebrahimi H. Comparison between effects of low and high frequency noise on mental performance. Appl Acoust 2017;126:131-5. Basner M, Babisch W, Davis A, Brink M, Clark C, Janssen S et al. Auditory and non-auditory effects of noise on health. Lancet 2014;383:1325-32. NIOSH. : Criteria for a recommended standard: Occupational noise exposure— − Revised criteria [Internet]. National Institute for Occupational Safety and Health; 1998. [cited 2017 Dec 1]. Available from: https://www.cdc.gov/niosh/docs/98-126/pdfs/98-126.pdf. [Cited 2017 Dec 1]. European Parliament and the Council of the European Union. Directive 2003/10/EC of the European Parliament and the Council of 6 February 2003 on the minimum health and safety requirements regarding the exposure of workers to the risks arising from physical agents (noise). 2003. Kahkashan A, Shivakumar V. Effects of traffic noise around schools on attention and memory in primary school children. Int J Clin Exp Physiol 2015;2:176-9. Boman E, Enmarker I, Hygge S. Strength of noise effects on memory as a function of noise source and age. Noise Health 2005;7:11-26. Smith A. Noise performance efficiency and safety. Int Arch Occup Environ Health 1990;62:1-5. Joseph C, Aravindakshan B, Vyawahare MK. 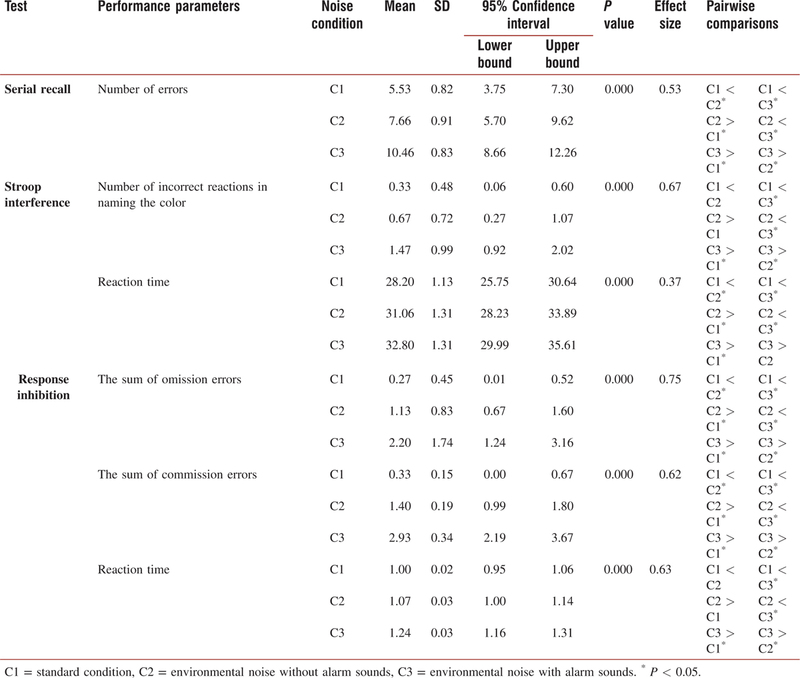 Non-auditory effects of noise: Psychological task performance. Ind J Aerospace Med 2000;44:49-56. Dolcos F, McCarthy G. Brain systems mediating cognitive interference by emotional distraction. J Neurosci 2006;26:2072-9. Denkova E, Wong G, Dolcos S, Sung K, Wang L, Coupland N et al. The impact of anxiety-inducing distraction on cognitive performance: A combined brain imaging and personality investigation. PLoS ONE 2010;5:e 14150. Muhrer E, Vollrath M. The effect of visual and cognitive distraction on driver’s anticipation in a simulated car following scenario. Transp Res Part F Traffic Psychol Behav 2011;14:555-66. Wais PE, Gazzaley A. Distractibility during retrieval of long-term memory: Domain-general interference, neural networks and increased susceptibility in normal aging. Front Psychol 2014;5:280. Kalanthroff E, Henik A, Derakshan N, Usher M. Anxiety, emotional distraction, and attentional control in the Stroop task. Emotion 2015;16:293-300. Mulligan NW. Attention and memory. In: Roediger HL, editor. Learning and memory: A comprehensive reference. Oxford: Academic Press 2008. pp 7-22. Björk J, Ardö J, Stroh E, Lövkvist H, Östergren PO, Albin M. Road traffic noise in southern Sweden and its relation to annoyance, disturbance of daily activities and health. Scand J Work Environ Health 2006;32:392-401. Rylander R. Physiological aspects of noise-induced stress and annoyance. J Sound Vib 2004;277:471-8. Miyakawa M, Matsui T, Kishikawa H, Murayama R, Uchiyama I, Itoh T et al. Salivary chromogranin A as a measure of stress response to noise. Noise Health 2006;8:108-13.